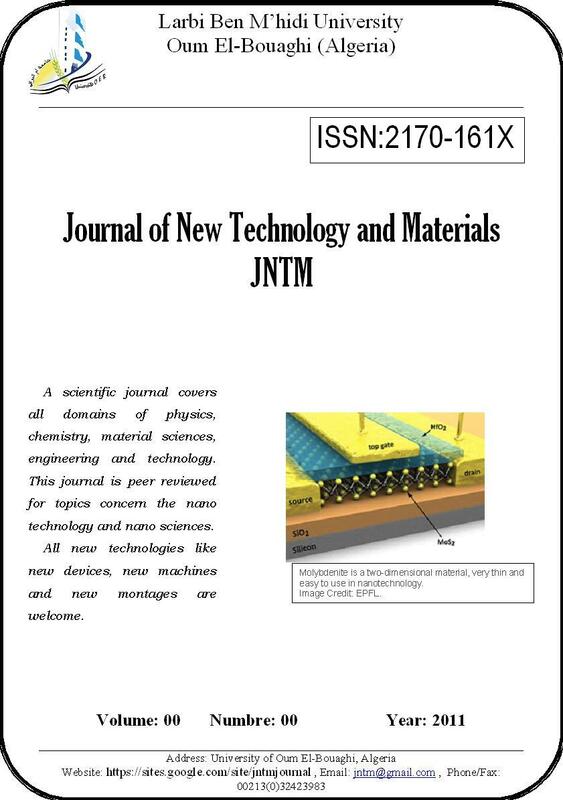 “Journal of New technology and Materials”(JNTM) is an international peer-reviewed journal that publishes high quality original works on the Material sciences (physics, chemistry and life sciences) and engineering. It covers the aspect of materials science and engineering in all forms, particularly materials associated with new technologies (nanoscience and nanotechnology). JNTM Journal provides a platform for researchers, students and industrialist to submit on-going research and developments in material and technology areas. Authors are solicited to contribute to the JNTM journal by submitting articles that illustrate research results and projects that describe significant advances in all areas covered by our scientific journal (JNTM). fr Science et Technologie Journal of New technology and Materials ?